I became interested in the book because the idea of the book came about because of an article the author came across titled “The Good Wife’s Guide” supposedly published in 1955 by Housekeeping Monthly. I had seen that same article because my husband brought it home and thought I should read through it. Ha! Anyway, we had a good laugh over it. Then I saw this book and I was curious about what Schacht was going to say about the wife’s role in the home and the Biblical piece to it as well. wives should submit to their husbands in everything.” This is where a lot of women stop reading and get upset. I agree, those are some serious expectations for us, but if you go on reading, you will find that God asks husbands to give of themselves as Christ gave of himself to the Church. The husbands have a much larger responsibility for loving, caring, and sacrificing for us in the same way Christ did all that for the church. So, if my husband is going to love me like that, I will be happy to love him back by serving and caring for him. Schacht goes into all this in more in her ebook. She does talk about how to keep your home and children presentable for your husband. She suggests removing the stress of the day and having a relaxed atmosphere for when your husband comes home from work. As much as this may sound absurd to some of you, I have found it to be very helpful. When supper is ready and kids are not running crazy around the house, we have such a lovely meal and conversation. Everyone is in a good mood. But, if I am stressed and lay it all on him as soon as he walks in the door and the kids are loud and running around, supper and the rest of the evening are guaranteed to be stressful. I am fortunate that I have a husband who is my “help meet” as well. If I am gone in the evening, he will do the dishes, help the kids with homework, etc. I don’t have to worry about the list of things that I still need to do. If he sees it needs to be done, he does it. That is the kind of marriage I think everyone should have and what God expected for us. There are times when we need to give and when we need to take. God wants us to serve and care for our spouses as well as bring out the best in each other and this book reminded me of that. Schacht closes out her book with chapters related to housekeeping. She offers schedules and tips for keeping your home in tip top shape. I appreciated her clear steps and ways to stay ahead of the mess. Overall, I really liked this book. It helped me see my relationship with my husband in a new light and even though I am not putting all of her suggestions into practice, quite a few have worked for me. 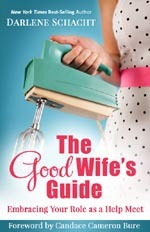 THE GOOD WIFE’S GUIDE is available on Amazon as an ebook, HERE for $4.95. You can also learn more about the author and follow her blog at http://time-warp-wife.blogspot.com/. Thank you for your review Stacie! I am also reading this. Only at chapter 4, I'm already very convicted by the words within! Thanks for the great review.